One story relates that Ganesh’s mother, Parvati, had to go for her bath when her husband, Shiva, was not at home. As Shiva had gone on a meditation retreat and was not expected to return, Parvati ordered Ganesh to keep guard and not let anyone inside the room. But after a while Shiva arrived and when he tried to enter, the child refused to let him do so. This angered Shiva, who did not recognize his son and cut off the Ganesh’s head. 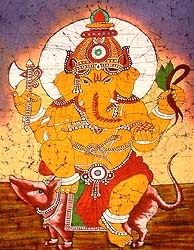 In order to make up for his mistake, Shiva promised Parvati that if she places the head of any person or thing which crosses her path early the next day, the Ganesh would come back to life. The first person or thing that passed by them was the mighty elephant. Shiva cut off its head and placed it on the torso of the beheaded child. Large Head: No, this does not mean arrogance! It signifies the importance of knowledge. No matter how much you know there is a lot more knowledge to acquire. The most brilliant and gifted people in this world are lifelong learners. This is also how business models also evolve. I see more entrepreneurs today than before and a higher velocity of technology innovation. It is more important than ever to use cross discliplinary approaches to solve problems and arrive at answers faster. Technology usage is no longer on the fringe, it is part of most people’s daily life, be it in India, Russia, Abu Dhabhi or Silicon Valley. Thus if you are a tech entrepreneur it is imperative that you understand the world around you, the (sometimes fickle) consumers/businesses and their psyche, and how they are evolving so that you can evolve with them. Thick Skin: This is self-explanatory. Most people find it easier to say no than yes, to criticize than embrace. Don’t take it personally and move on. Large Stomach: There’s value in taking in information and allowing it to sit and digest. Not everything useful you are exposed to will be useful right away but don’t be so quick to dismiss it. File it away and it may come back in a different form or in the same form at a more relevant point in time. This is true with people too. If you come across people that are bright and impressive, keep in touch with them. I can’t even count how many times I’ve ended up doing business with people I first met years ago and kept in my network. Trunk: We all know the story of the mighty elephant trunk being flexible and controlled enough to pick up a peanut. You want to be that elephant trunk. Be strong, but nimble, especially as your company grows. It is too easy to get unwieldy with growth. Last week, I was honored to be named in the Top 50 Asian Americans in Business, with Tony Hsieh, CEO of Zappos, as the chief honoree. He just wrote a book, Delivering Happiness, and spoke of the importance of establishing company culture, vision, and values early on. Put in systems and policies to support these early, before you may need them, as rapid growth (overall a good problem to have) can overtake small companies very quickly. The companies that maintain a core set of values and, most importantly, employees who embody those values, are best able to survive that rapid growth. Build a strong company from within, and ideally one that has mechanisms that empower employees to stay responsive to the market. Outstanding examples that lend great inspiration. Great article Jalak. I enjoyed reading it. Your Ganesha post reminded me of all of the reasons I keep the Ganesh paperweight I bought in Delhi on my desk next to my computer. It’s my morning inspiration and my mid-afternoon frustration meditation. Great story. Also, you write about Siri one post down. There’s an interesting YouTube video about SIRI around that site somewhere. The guy has some great points. One of them is that Siri app on an iPhone could be used to make the iPhone into a teaching tool and a learning device. What are your views on edtech and the sector that is trying to drive education evolution through the use of new technology that is hardware-centric and web-based? Hi Douglas, thanks for your comment — I will look for the YouTube video on Siri. Generally I don’t think enough innovation has been incorporated into the ed sector. The area of customized learning is particularly interesting to me — to be able to incorporate real time adjustments to each student’s learning so that they don’t lose valuable time — particularly the ones that are already so behind due to their circumstances. A mobile phone app to do this would be a great way to extend learning (and games methodologies would be crucial here) beyond the classroom. Thanks for responding, Jalak. Here’s the video. I thought I would save you the search. The video is very cool!I’m glad that I watched it!